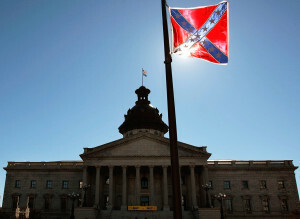 Members of South Carolina's NAACP will march in protest of a "secession ball" in Charleston later this month which will commemorate the 150th anniversary of South Carolina's secession from the Union. "We are not opposed to observances," said Lonnie Randolph, state president of the NAACP. "We are opposed to disrespect." NAACP members and supporters plan to hold a peaceful march in downtown Charleston the day of the ball, on Dec. 20, followed by a meeting and question-and-answer session focusing on slavery. Participants will watch segments of "Birth of a Nation," a 1915 silent film that portrayed Ku Klux Klan members as heroes. Nearby at Charleston's Gaillard Municipal Auditorium, ball attendees, who will pay $100 a ticket, will don formal, period dress, eat and dance the Virginia Reel as a band plays "Dixie." The evening's highlight will be a play reenacting the signing of South Carolina's Ordinance of Secession 150 years ago, which severed the state's ties with the Union and paved the way for the Civil War. "This is nothing more than a celebration of slavery," Randolph said of the event. Members of the S.C. Sons of Confederate Veterans, a co-sponsor of the ball, say slavery was one of several issues that caused – but it was not the cause – of the Civil War. The ball is a way to honor the brave S.C. men who stood up to an over-domineering federal government, high tariffs and Northern states that wanted to take the country in an economic direction that was not best for the South, said Mark Simpson, the S.C. division commander for the Sons of Confederate Veterans. Simpson said his organization condemns slavery and respects the NAACP's right to disagree and protest. But that won't deter his group's plans, Simpson said. "We could look back and say (the Civil War) wasn't something to celebrate – about 620,000 died in the North and South," Simpson said. "If you count civilians, you're up to about a million killed in that war. "Do we celebrate that? Heavens no," he said. "War and death is never something to celebrate. But we do celebrate the courage and the integrity of 170 men who signed their signatures to the Article of Secession – the courage of men to do what they think is right." Randolph said the Civil War was about states' rights, one in particular. "The states wanted the right to sell human cargo," he said, adding the public would not tolerate similar disrespect of other minority groups – a Holocaust celebration or an event celebrating the atomic bombing of Hiroshima. "The reason this can take place so easily is we're still suffering the effects of the Confederacy in this state," Randolph said.